It's autumn. There's no doubt about it. Or is there? Certain visual signals in the city are confusing. The sun is shining and the temperature is the same as in April. 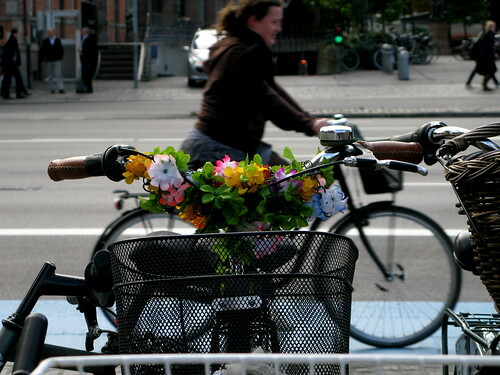 Colourful flowers on bike baskets, as above, are a century-old tradition but they send your mind into springtime. Then there's this shot. This is confusing. Brightly coloured flowers on a city square. The chairs stacked up could be a sign of the start of the outdoor serving season - indeed that is one of the surest signs of spring in Copenhagen. The cafés start stacking chairs outside waiting for the first mild day. The girl's outfit is certainly springlike. Skirt and stockings, as though it's the first day she shed her jacket, which is in her basket. All very lovely and very confusing. 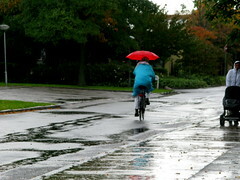 Hey, how about a "how to ride a bicycle in the rain.. WITH STYLE" post? Us North Americans can be pretty dorky about dressing up for rain or else we don't know how to do it at all. we have a number of posts of rainy days. this one is a good one. it includes a rainy day film. I recommend wearing a stylish rain coat and a short skirt and nylon stockings. The stockings will dry in a jiffy and if the rain coat is long enough only the hem of your skirt will get wet. Voila! Stylish rain wear. For women or cross dressers anyway.